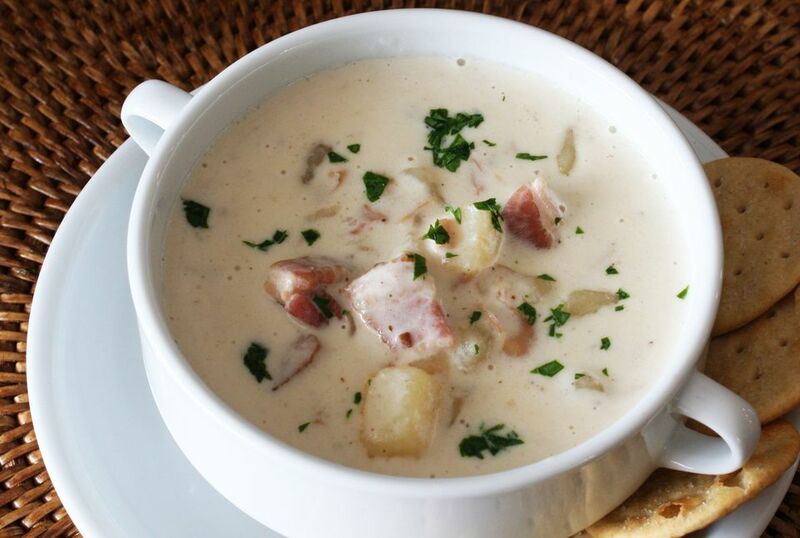 This is an easy and great-tasting clam chowder for the slow cooker (or crock pot). It's made with potatoes and milk, a little bacon or salt pork, and canned minced clams. Cornstarch makes the chowder thick and satisfying. Bottled clam juice is the best choice for the liquid, but water or chicken stock may be used instead. If you use salted or low sodium chicken broth in the soup, you might need to cut back on the salt. Add a small portion of the salt and wait until it is nearly done to taste and add more, as needed. Once you make this, you'll see how tasty and easy this chowder is. If you take it to a potluck, take several copies of the recipe! If necessary, chop or slice the clams into bite-sized pieces. In a skillet, fry the diced salt pork or bacon and onion until golden brown and then drain. Alternately, if you have a crock pot that has a sauté feature, fry the bacon right in the crockpot, then drain some of the fat. Add the pork or bacon and onion to the slow cooker with the minced or chopped clams. Add the potatoes and the water, low-sodium chicken broth, or clam juice. Add 2 teaspoons of salt (1 teaspoon if you used broth) and the freshly ground black pepper. Cover and cook on HIGH for 3 to 4 hours or until vegetables are tender. During the last hour of cooking, combine 1 cup of the milk or half-and-half with 4 tablespoons of cornstarch. Add the cornstarch mixture and the remaining milk or half-and-half to the slow cooker and stir to blend. At this point, taste and adjust the seasonings, adding more salt, as needed. Top each serving with a sprinkling of chopped fresh parsley and serve with saltines, oyster crackers, biscuits, or crusty French bread. Add 1/2 cup of chopped celery to the skillet along with the onions. Use less salt pork or bacon to cut fat and calories. Or make the dish with diced lean ham instead. Add a teaspoon of chopped fresh garlic when the onions and bacon are browned and cook for about 1 more minute. For a richer chowder, use only half-and-half instead of milk. Fry a few extra strips of bacon. Crumble the extra cooked bacon and refrigerate it to use as a garnish for the finished chowder. Instead of chopped fresh parsley, use sliced green onion tops, shredded mild cheese, or chopped chives to garnish each serving.